I’ve noticed that lichen seems to come alive in the winter. 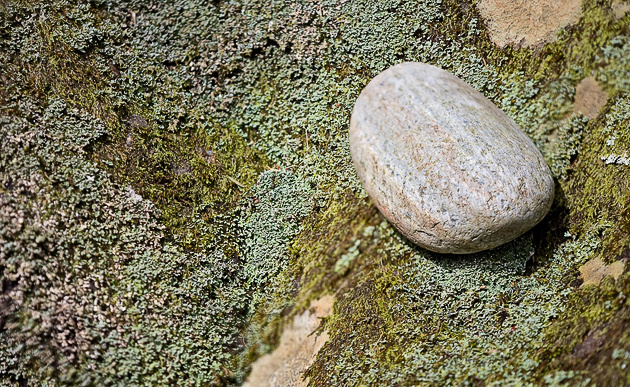 In the Smoky Mountains, lichen are everywhere, on boulders and rocks and tree trunks. 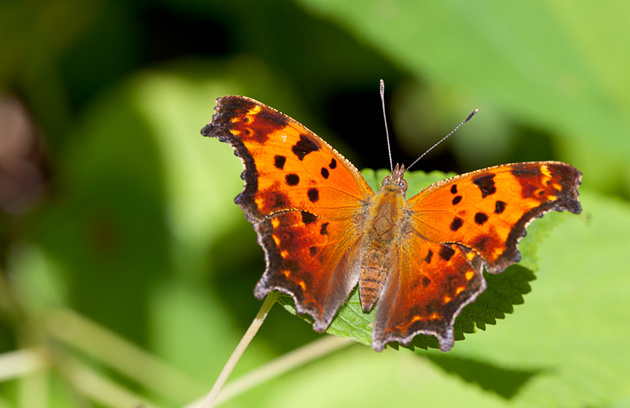 Maybe they stand out in winter because they are not competing with the lush green foliage of summer. 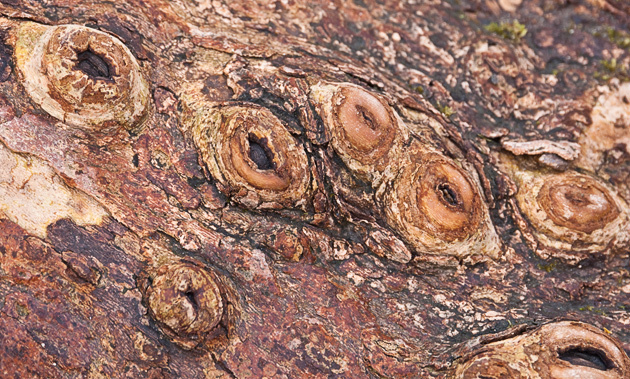 In any case, wandering the quiet winter trails, the lichen really jump out at you. 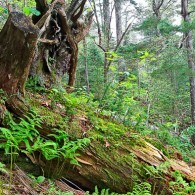 The photo above is a large boulder sticking out of the ground along the Porters Creek Trail in the Greenbrier section of the Smokies. In summer it is quite ordinary, but in winter … neon green! 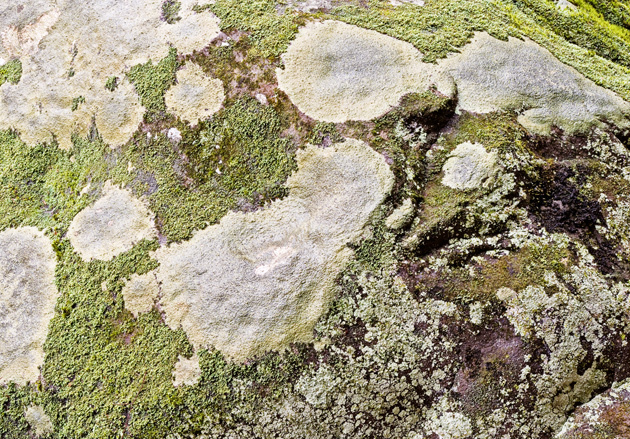 A lichen is an odd organism made up of a fungus and a partner that provides photosynthesis … either an algae or a bacteria. This can happen in many different ways … if you think wildflowers can be difficult to identify, don’t even think about lichens! 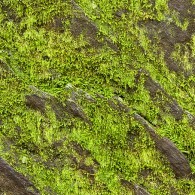 Lichens are persistent and long-living, existing in extreme conditions. I admire them for that, and for their subtle beauty. 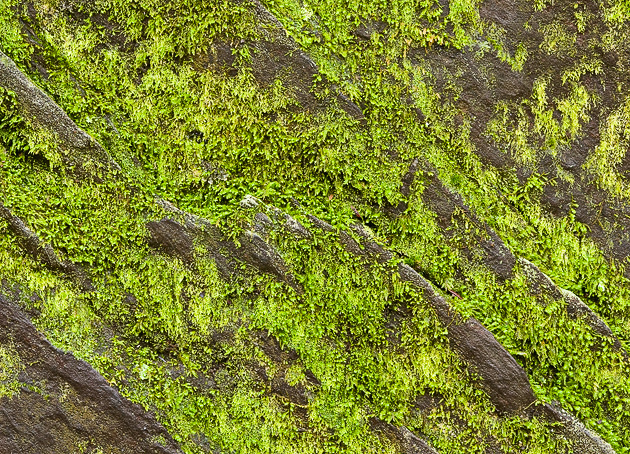 It’s a fun winter pastime to look for abstract compositions in the boulders and lichens. There are literally hundreds of possibilities. As usual, the door is open out at the William Britten Gallery on the Arts and Crafts Loop along Glades Rd in Gatlinburg. You’ll find my complete display of photos of the Smoky Mountains. Also, if you enjoy facebook, please click the “Like” button on the panel to the right for frequent updates, bonus offers, and extra photos. 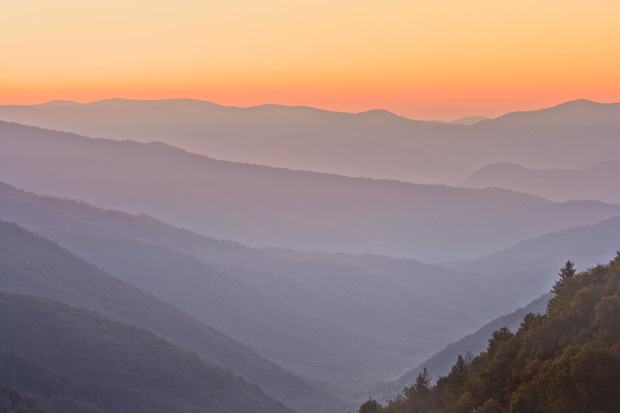 A commitment is required to experience the quiet grandeur of a Smoky Mountains dawn such as this. 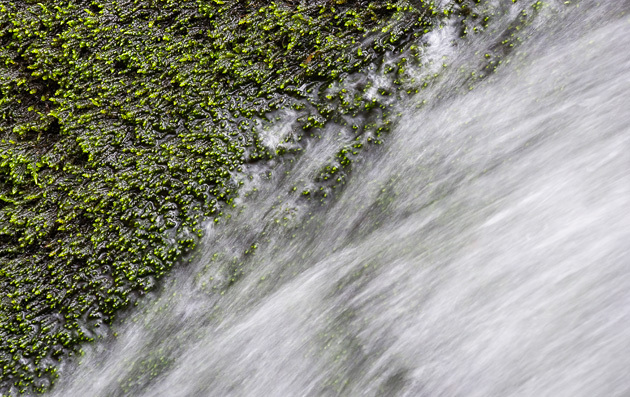 With close to an hour drive from the Gatlinburg area, it’s a very early wake-up call. And it’s a gamble, since on any given day you may experience only dense fog at the mile-high elevation. But the rewards can be enormous as you witness the beginning of one single day on planet Earth. The colors changing so fast you can’t take your eyes away. The ridges appearing out of the gloom with their soft pillow of fog, more than a dozen of them adding to the sense of depth in this picture. 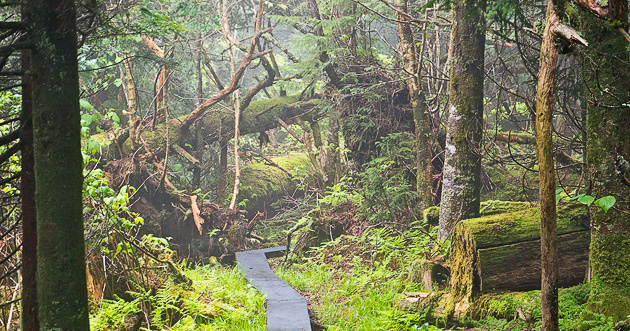 Listening to Silence is one of my more recent Smoky Mountains photos. 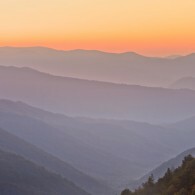 It was taken from the Oconaluftee Valley Overlook on the Newfound Gap road, looking east into North Carolina at sunrise. This is a picture that can command a large space, a picture that you can stand in front of and get lost inside it. It’s offered in all sizes, including the largest 20×30. Details of sizes and pricing can be found on the How to Buy page. Like most of my photographs, Listening to Silence is quiet and contemplative. It has a way of drawing you into an easy-going, meditative space. And it has an almost magical quality of changing as the light in a room changes. Any light, whether from a lamp or a window, will cause this photo to glow. If time allows during your Smokies vacation, please stop in and visit me to see the complete display of Smoky Mountains Photos at the William Britten Gallery on Glades Rd in Gatlinburg, TN. There may be a special mountain memory for you to take home with you! 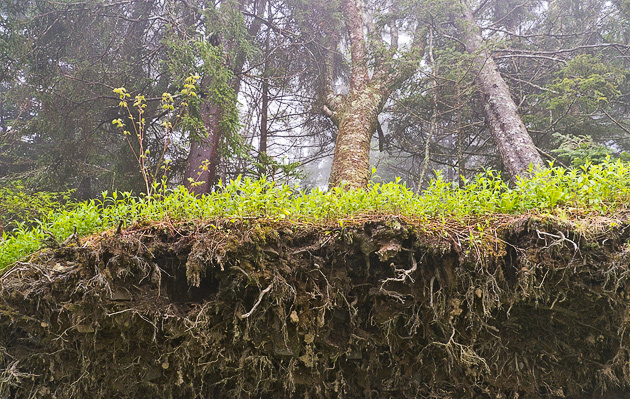 The photo above and below show how densely packed life in the Smoky Mountains is. No sooner does a big tree fall than the recycling begins. 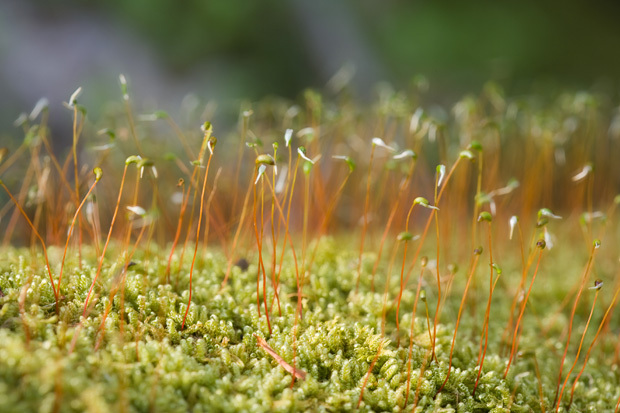 Moss and lichens, then ferns and little pine seedlings. Death becomes life, and the old is made new again. 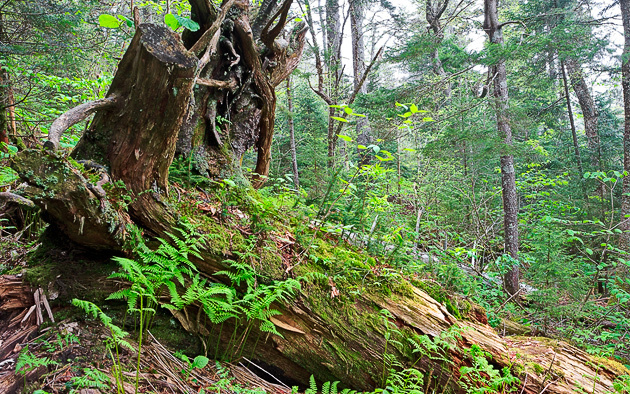 In the Smoky Mountains, nothing is “cleaned up” unless it is blocking a trail or road. If it falls or blows down or is burned, there it lays. 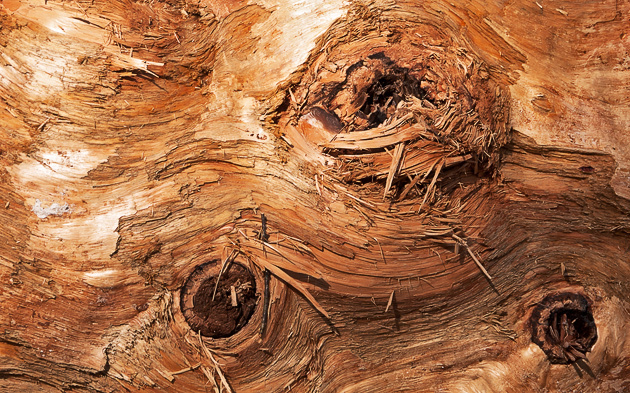 As in the photo below, things can get very jumbled in the woods, with layers of fallen trees being worked on by the natural process of decay and renewal. In the jumble and chaos is a natural rhythm and plan. Just like in my studio! 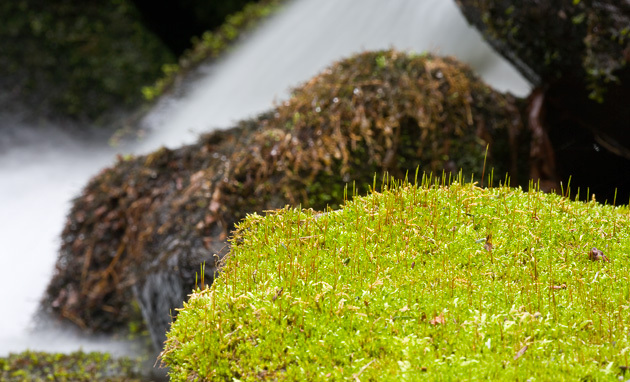 You’ll find many peaceful examples of natural beauty at the William Britten Gallery on the Arts and Crafts Trail along Glades Rd. in Gatlinburg, TN. 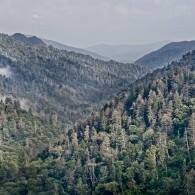 Please stop in and see if I can send a special Smoky Mountains photo home with you! I headed out to the northwest corner of the Smoky Mountains last week, looking for the wildflower Indian Pink. I found the flower, but also found a couple of reptiles that were not on my agenda! 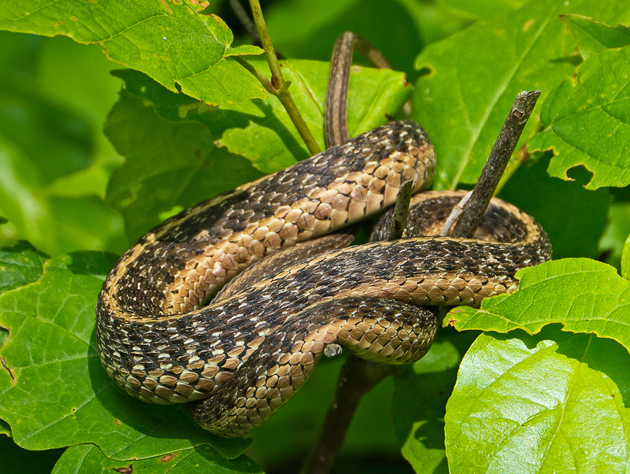 First, working my way up Ace Gap Trail, eyes glued to the ground to spot those tiny wildflower blooms, suddenly about two feet off the ground was the snake in the photo above. Since then I’ve identified it as a common and harmless garter snake, but on that morning a snake coming into my field of vision at such a close range was quite startling! But not so nerve-wracking that I couldn’t stop and take a photo. 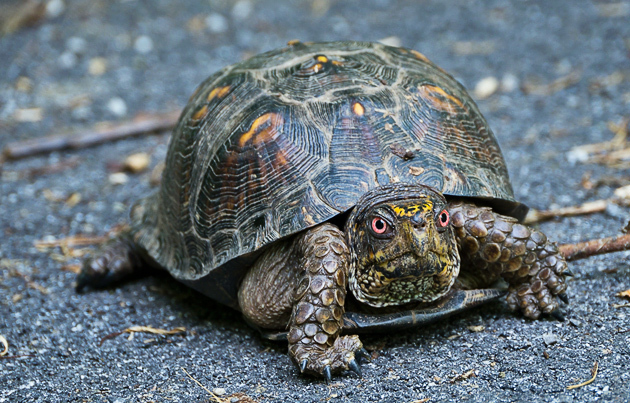 Then later, after the hike, with lots of good pictures of the Indian Pinks in the camera, I spotted the turtle in the photo below. 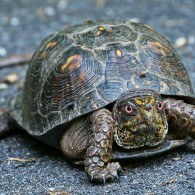 He was crossing the road near where I parked the car. If looks could kill! He was not happy about being asked to stop and pose for a picture. 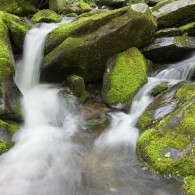 The William Britten Gallery along Glades Rd in Gatlinburg has the complete display of Smoky Mountains Photography. 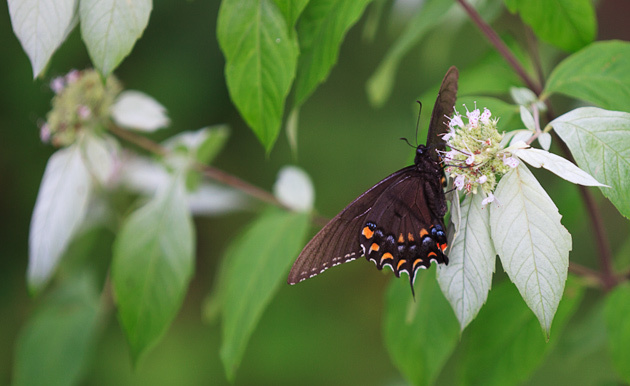 Please stop in for a visit during your trip to the Smokies. There may be a special photo to remember your trip. 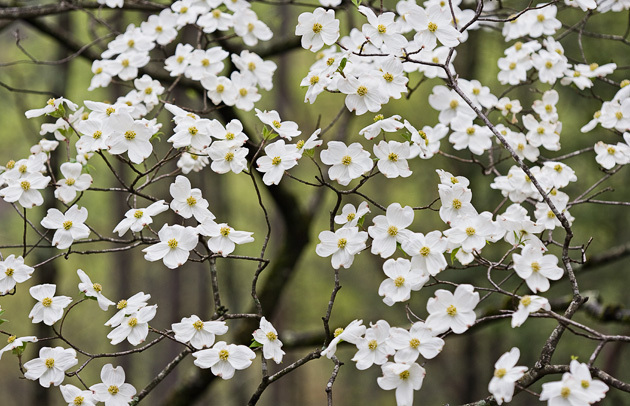 In April of every year the Smoky Mountains are showered with dogwood blooms like a late spring snowstorm. 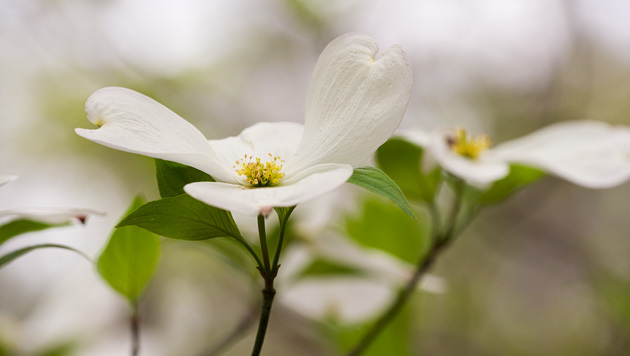 Everywhere you go … up in the Greenbrier, along the Little River or the lower elevations of the Newfound Gap Road … in Elkmont and Tremont … the dogwoods sprinkle their blooms like white notes on the bare woodlands hungry for music. The opportunities for taking great photos are everywhere! 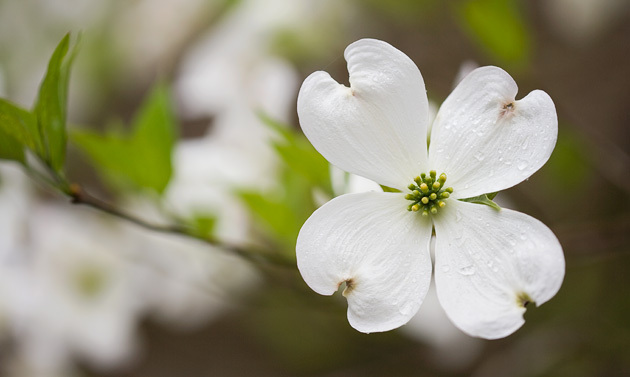 If you walk among the dogwood trees, and get real close-up, their blooms are a happy confirmation of the joy of life and the renewal of springtime. 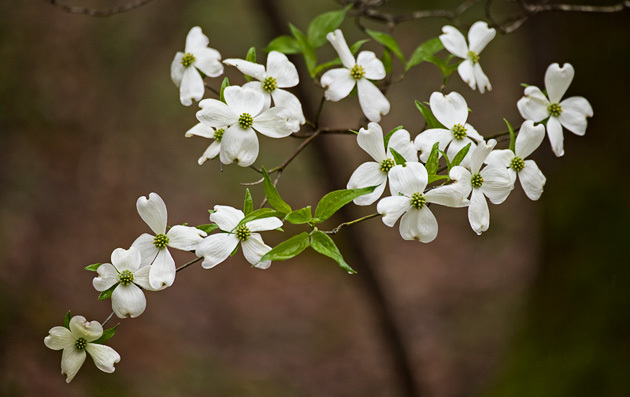 It’s hard to tell exactly when, but sometime between the 10th and 20th of April, the Smoky Mountains dogwoods will reach an intensely delicate peak. Some of the best locations in the Smoky Mountains for beautiful drives with the woods decked in white are the Greenbrier area and the Tremont area. After your hike, or on a rainy day, please consider a visit to the William Britten Gallery on Glades Rd here in Gatlinburg. I’m in Morning Mist Village, right next to the Cafe courtyard. 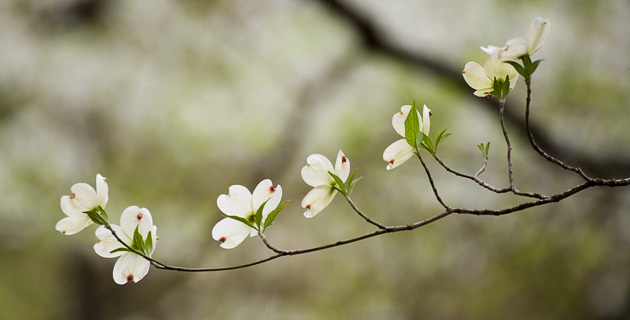 The Gallery contains my complete display of Smoky Mountains photography, with several best-selling Dogwood images: Dogwood Rain, Dogwood Tapestry, and Dogwood Lullaby. 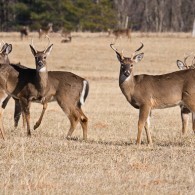 Last week I headed over to Cades Cove with these deer in mind. In winter they tend to congregate in large groups in the central meadow of the Cove. I parked along the loop road and walked down into the field among the herd of young bucks. 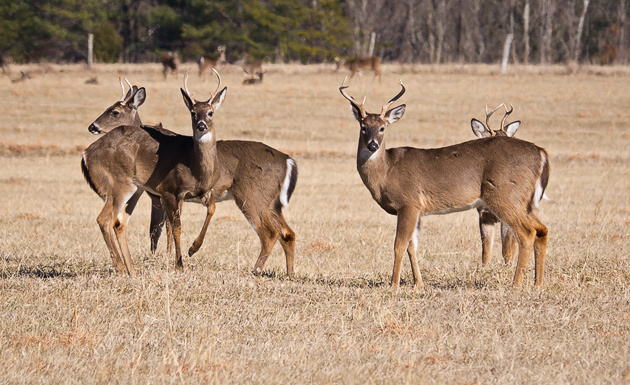 Don’t ask me where the doe or the old bucks were … these were a bunch of young guys. It’s a lot like walking into a cow pasture. The deer were barely interested in me, certainly not threatened. My new interest in video was a perfect match for these bucks frolicking in the winter sun. You can also view a full-size version. Please stop in and visit me to see the complete display of Smoky Mountains Photography at the William Britten Gallery in Gatlinburg, TN. 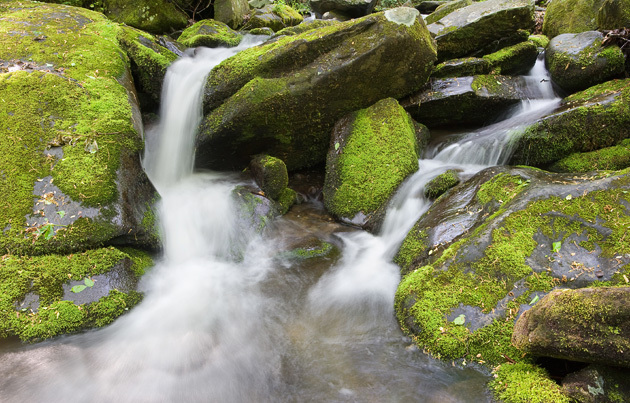 I was walking along the road to the Ramsey Cascade trail in the Greenbrier section of the Smoky Mountains last week. Just out for a stroll, with my little GF1 attached to a monopod like it was a walking stick. Another photographer came out of the woods onto the road, and we exchanged a greeting. 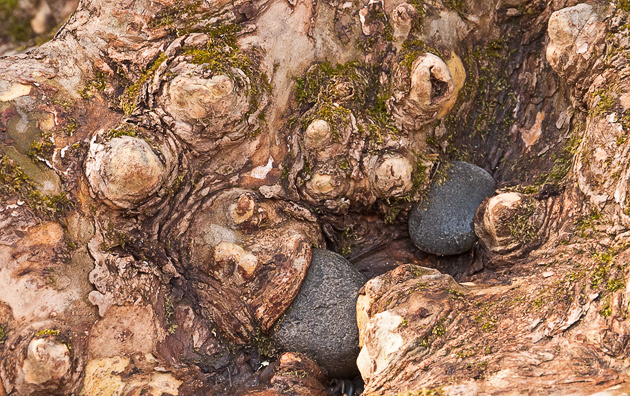 He said there were some interesting sycamore roots over by the creek in a wonderful golden morning light. Said he could get lost for hours just exploring a small section of the Ramseys Prong. So I took the bait, and headed into the brush, and sure enough there were some fine sycamore roots proudly displaying in the morning light. Sycamores like wet feet, so they are often found right along the stream banks. But they pay a price for that when every high water brings a bunch of junk flowing over the roots and bashing into them. 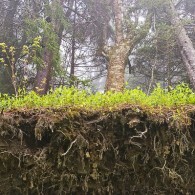 But all that bashing makes the roots quite lovely in a gnarly way. 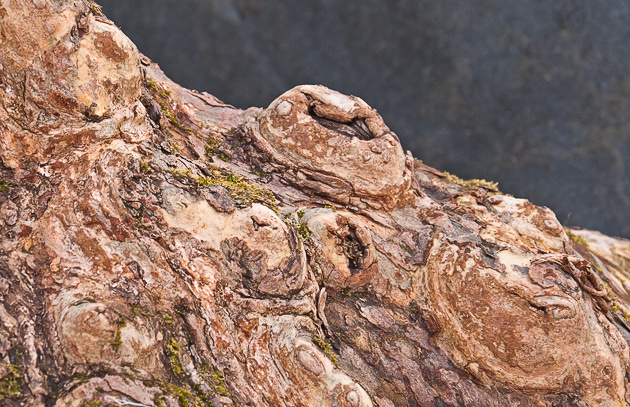 Spending some time with these sycamore roots was a fine meander, and eventually I made my way back to the road and on up the the Ramsey Cascades trail. 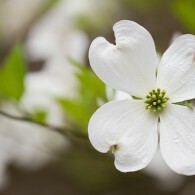 As usual, if you’re in Gatlinburg please stop in for a visit at the William Britten Gallery on Glades Rd. to see the whole display of Smoky Mountain photos. 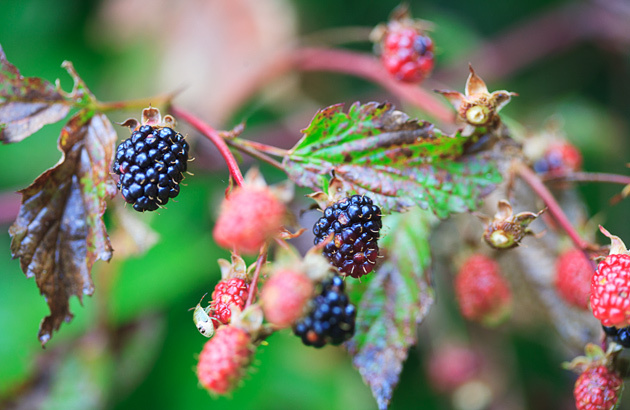 Blackberries are ripening along the Appalachian Trail in the higher elevations of the Great Smoky Mountains National Park. 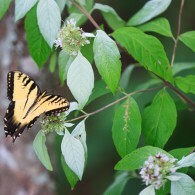 The image above was taken in the Clingman’s Dome area. 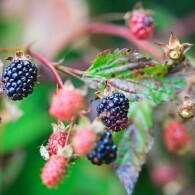 Of course, the black bears love blackberries too! 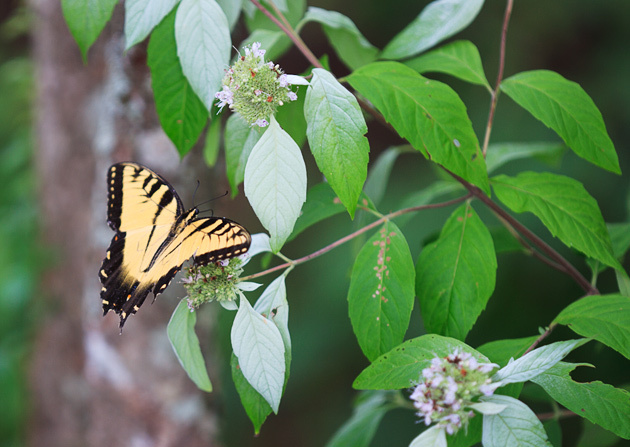 The picture above is from Mortons Overlook near the top of Newfound Gap Road in the Great Smoky Mountains National Park. Looking down the valley towards Gatlinburg, you can see the Chimney Tops towards the upper left of the image. 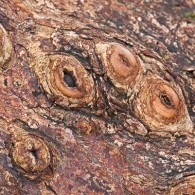 You can also see many dead fir trees. 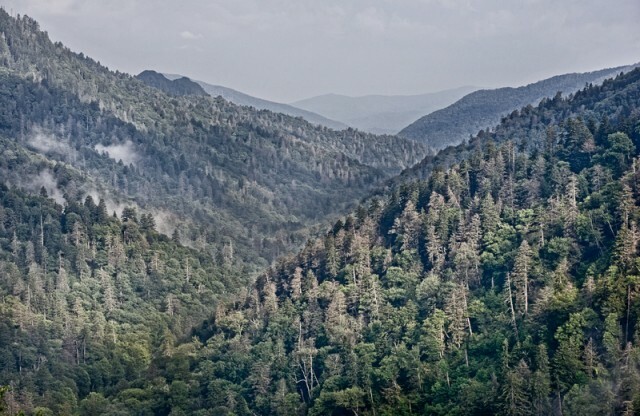 As many friends of the Smoky Mountains know, an invasive species called the Woolly Adelgid has attacked fir trees with devastating results. Up on Clingmans Dome the destruction is even more evident. 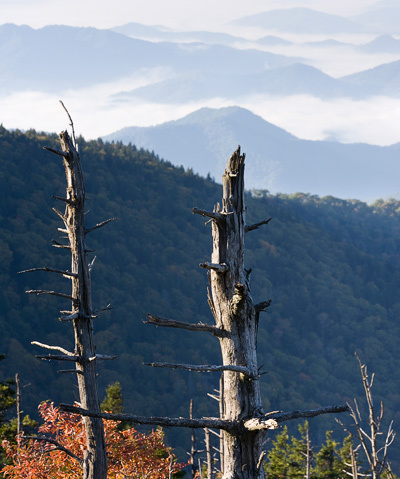 For years to come our experience of the high-elevation Smoky Mountains will be one of grand vistas punctuated with nevergreen skeletons.